This is really refreshing, I’ve only had these ever in Chinese herbal tonic and soups, since it’s an ingredient in Traditional Chinese Medicine. However, I tried to research on Himalayan Goji Berries and didn’t find enough evidence that this is a real separate species from the wolfberries, so not sure if it’s a marketing spin. You can find wolfberries (which look like the goji) in Chinese medicinal shops, and much cheaper than the organic goji berries. The chinese name is gou qi zi, which might be where the word ‘goji’ is derived from. 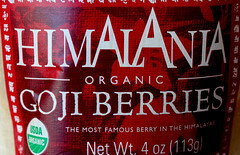 I am curious that you find the goji berries to taste like figs. I had bought some but hadn’t used them. And I just read about them in a magazine and the taste described there was that they were a little bit like raisins. I am going to have to make some oatmeal cookies and use them instead of the raisins. You know, I am intrigued by this cupcake. I haven’t had goji berries before. As for the pink salt, go check out a World Market, I got a lot there for about 2 bucks. Saffron and vanilla beans are also incredibly fresh and crazy cheap. It’s my spice secret. Welcome back, I and I am sure many others have been checking your pages regularly in anticipation of your next recipe. And we have not been disappointed. It sounds delish, both good and bad at them same time, so therefore neutral. Excellent. amazing, as usual. i love the pink salt–just wonderful. When I say good and bad, I mean calorie wize or good for you and bad for you – all your cupcake are fab. I just re-read my post and it sounded weird. I love this site. The cupcakes are just wonderful. I tried the grapefruit and Pomegranite cupcakes and they were a hit. I look forward to many more recipes. Thanks for the tip about the World Market, I will look for many items called for in these recipes there. Pink Salt? Thats new to me. Keep up the good work. My wife made goji cookies a few months ago. I developed an intense nocturnal craving for them. I would wake up at 4 am and go eat about 6. after that i’d morph into a giant frosting-loving panther and roam the house. neighborhood cats were frightend. one night my wife claims she found me on top of the 8 foot tall wardrobe licking the tops of my hands, a stash of shredded cupcake papers nearby. I don’t remember it that way. 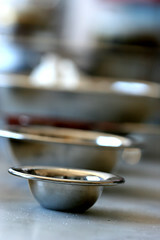 Could be used in baking – they are pleasent tasting enough. I found a site for you to read – should it interest you. It is not a medical site. Should you prefer a reviewed site I would send it to you. LOVE your creativity! I haven’t tried Goji berries yet- Maybe because I read they taste like a cross between dried cherries & raisins and didn’t think that was worth the prohibitive price. But this sounds awesome! Hmmm, sounds interesting. I tried Gogi berries a few months ago and I have to be honest, they were foul. Maybe the chocolate ganache brings about a chemical reaction that releases a wonderful hidden undertone in the berry’s flavour…?! Seriously, I love your brave and inventive recipes – keep up the great work. Your website often lifts me up beyond the grind of my desk job! Definitely interesting, although not a recipe I think I would be up for trying myself. Hello! FYI they sell large bags of dried goji berries at Costco now as well. Hi Chockylit: I’ve a question. I’m in charge of making the dessert for my mom’s 50th birthday party and want to make cupcakes. It will most likely have a French theme. Any suggestions? Thanks! Hi, Honor. That is a tough question. When baking for a friend or relative, I tend to start with a flavor that that they really like and go from there. Sometime I will even be inspired by a color (for example my friend really likes green) and that becomes a flavor (like green tea), that becomes a cupcake (which I won’t talk about as they are a surprise). Wonderful- Thank you! Right now I’m thinking about a lemon cake with raspberry filling & white vanilla buttercream (flavors she likes.) But I’m sure I’ll come up with other ideas before then. Thought of you last Saturday. Rosamunde Sausage Grill in SF had a special of pheasant with goji berries. Yummy. Wow, these look amazing. 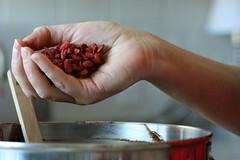 I’ve been hearing so much about those Goji berries, I really need to try them! Sounds great. You can find these berries on Clement St or Chinatown in SF for a fraction of the price. Fun site. I heard there is a new cupcake bakery in SF. the second after Citizen cupcake. yeah. it’s called kara’s cupcakes on scott at chestnut. i haven’t been yet. Oh, and I also want to visit Love at First Bite Bakery and Cupcakery on Walnut. I’m seeing Goji berries everywhere now. Rainbow Grocery has them in bulk for $9.99/lb. I have to admit, as a child, I didn’t not have the proper Filipino appreciation for salt. Patis–blah! Salted fish–please, are you kidding me? Yes I like goji berries myself also, I have tennis elbow from weight lifting and I seriously believe that goji juice has helped tremendously with that. It does not become as inflamed as it used to. This is a delightful and healthy cupcake. I’ll ask my wife to copy this recipe. Hello! Just putting a short little note in your blog comments to say whats up from Victoria, which is up here in Canada. I am continually impressed at the quality of blog commentary that I can come across on the internet by smacking the “I’m Feeling Lucky” option on Google! That’s pretty much all from me, I hope you have a great July!